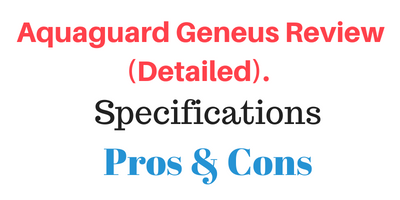 If you are looking for Aquaguard Geneus review then you are at the right place. You will get to know all the specifications as well as pros and cons of this water purifier. Aquaguard geneus is a very popular water purifier in the Indian market. It comes with RO, UV and UF water purification technologies. It also comes with a TDS controller which qualifies it to purify any kind of water whether it is hard water like bore well water or soft water like water from Municipal water supply. The most interesting part about this water purifier is, it comes with pretty advanced sensors which are very practical as well. Additionally it has a very elegant looks and it also comes with a glass holding lever as well. With that being said lets begin the review. 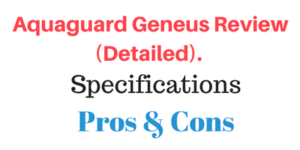 First let’s have a look at the design and build quality of Aquaguard Geneus. Aquaguard Geneus is made from Food grade plastic which is non-toxic and durable as well. Aquaguard geneus comes with a very elegant design which will enhance the look of your kitchen. It also comes with a glass holding lever so you don’t have to hold the glass of water which is quite convenient. It comes with LED indicator panel and just below that traditional water dispensing tap which does not require electricity for dispensing. So you can dispenser water even without electricity if there is water in the purified water storage tank. This water purifier also comes with a glass holding tray. You can put a glass or 1 liter water bottles on it to fill it, which is quite convenient. This water purifier comes with 7 litre water storage tank. This is a wall mountable water purifier but it also comes with a very good base which allows you to put it on table and use it very conveniently. Now let’s talk about the purification of Aquaguard Geneus. It also comes with an advanced sensor which basically senses what kind of water purification would be most suitable for the available water. For example, if the water you are using is not a hard water then this water purifier will only purifier the available water with UF and UV water purification technologies. As the water is not purified with RO water purification the natural essential mineral will still remain in the water. So this way, this feature basically helps to retain the essential minerals in the water. Now let’s have a look at all the three water purification technologies of Aquaguard Geneus. If you have hard water then RO water purification is required for the purification of such water. The RO water purification is consist of RO membrane which has very minute cause of 0.00001 microns. Water is passed with a great force through this RO membrane, which separates dissolved solids and solids as well as harmful heavy metals like mercury, arsenic and lead from the water. Ultimately converts the hard water into soft water. Aquaguard Geneus comes with G-Flush Technology which flashes out crystals from the the RO membrane. This not only increases the life of the RO membrane but also maintains the purity of the water. As mentioned above during our purification the dissolved salts and solids as well as heavy metals are removed from the water. But at the same time some natural essential minerals such as calcium ,magnesium and iron also get removed during our RO purification. Test Guard Technology basically helps to retain such essential minerals. Now let’s see the UV and UF water purification of this water purifier. This stage is consist of UF membrane and it removes the physical or visible impurities like sand, mud, dust etc from the water, making the water clean and clear. When there are no physical or visible impurities remained in the water then the water is passed for UV purification. The UV purification is consist of UV bulb. At this water purification stage water is exposed through the UV rays of the UV bulb which inactivates harmful bacteria, viruses and protozoa from the water making the water 100% microbe-free. Aquaguard Geneus comes with a TDS controller, which as the name suggest allows you to control the TDS of the water. With TDS controller you can literally set the TDS of the water as per your wish. Usually the TDS between two 250-500 is considered as ideal for consumption (although acceptability may vary according to circumstances). With the RO, UV and UF water purification, advanced sensor and TDS controller Aquaguard Geneus has a very solid water purification system. This water purifier is eligible to purify any kind of water whether it is hard water like borewell water or soft water like Municipal water. Aquaguard Geneus comes with 7 litre water storage tank. Now let’s talk about the sensors this water purifier offers. As mentioned above the advanced sensor basically senses what kind of water purification would be required for the available water, which helps to retain the essential minerals in the water. This sensor basically warns you if any duplicate cartridge or filter is fitted in the water purifier with a beeping sound which is quite useful. This water purifier performs all its operations like filling the water storage tank whenever the water level decreases and it will automatically turn off the filling operation once the water storage tank is fully filled with the smart autofill feature. Aquaguard Geneus comes with an User-friendly LED display which allows you to adjust the purification process and it will also show you the water level in the water storage tank. This water purifier will notify you whenever you will have to change any of its filter with LED indicator. Now lets see the Pros and Cons of Aquaguard Geneus. Aquaguard Geneus comes with 1 year manufacturer warranty. Users are very happy with the elegant looks and purification of this water purifier. They also appreciate its intelligent sensors. If you are looking for a RO water purifier with elegant looks and solid water purification then Aquaguard Geneus is ideal for you. This water purifier has a very elegant looks as well as it also comes with a glass holding tray which is quite convenient. This water purifier comes with a 7 litre purified water storage tank. Additionally it also comes with a TDS controller which allows you to set the TDS of the water as per your wish and the Taste Guard Technology which basically helps to retain the essential minerals in the water which not only makes the water healthy but also tasty. This water purifier also has a very good alert system which will notify you whenever you will have to change its filter also it will allows you to set the water purification process as well. Additionally this water purifier comes with very good intelligent sensors such as Genuine Membrane Sensor which warns you if any duplicate cartridge or filter is fitted in the water purifier. And the Smart Autofill feature allows it to perform all the operations automatically like filling the water in the water storage tank when the water level decreases and automatically shutting down the filling operation once the water storage tank gets fully filled. Additionally, this water purifier also comes with the G-flush Technology which basically flushes out all the crystals which could get deposit on the RO membrane. This technology not only increases the life of the RO membrane but also it maintains the purity of the water. Overall Aquaguard Geneus has a very solid water purification system and users are very happy with it. So that was all about Aquaguard Geneus Review. If you have any doubts don’t forget to check out FAQ section below or leave a comment. 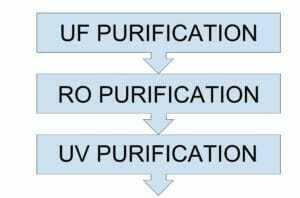 RO, UV and UF are basically the water purification technologies. First let’s talk about a RO purification. The RO stands for Reverse Osmosis. The RO purification consists of RO membrane which has very minute pores. Water is passed with the great force through this RO membrane which separates harmful dissolved salts and solids as well as heavy metals from the water. UV stands for Ultra Violet. It is consist of a UV bulb. This is also a pretty advanced water purification technology. In the UV purification, basically water is exposed to the UV rays of the UV bulb, which inactivates harmful bacteria, viruses and protozoa from the water. UF stands for Ultra filtration. This is a very basic water purification technology and it removes physical or visible in purities (sand, mud, dust etc) from the water. This dissolved solids can have beneficial minute all such as iron, calcium and magnesium and also harmful dissolved salts and solids as well as harmful heavy metals like mercury, arsenic and lead. RO purification is required to remove such harmful contaminants from the water. How does it works during power outcuts? This water purifier requires electricity to purify water but if the purified water is already stored in the water storage tank then you can dispense the water without any help of electricity. Can I put water bottle on the glass holding tray? Yes, you can put 1 litre water bottle or a glass on the tray. How much water is wasted during RO purification with this water purifier? It really depends upon the quality of the water is purifies. Usually 25-50% water get wasted during a RO purification. You can reuse such waste water for gardening mopping and for cleaning vehicles. No, it does not comes with a pre filter. It is not mandatory to have a pre filter but it is a good idea to have one because it will add a more layer of protection. You can check price here. When do I will have to change its filters? You will have to change its filters after 1 year or after 6000 litres of water purification (which river comes earlier). This water purifier comes with a filter change alarm which will notify you about the same. Whats the filter change cost of Aquaguard Geneus? The filter change cost of Aquaguard Geneus varies from Rs 1000-6000. For more information click here. Does it comes with a water storage tank? Yes Aquaguard geneus comes with 7 litres of water storage tank. Is the glass holding tree detachable? Is it a wall mountable water purifier or a tabletop? You can use this water purifier both ways. Either you can Wall mount this water purifier or this water purifier comes with a very good base so you can use it on table top very conveniently. What about the water connection to this water purifier? As this water purifier requires continuous water flow, you should connect this water purifier with overhead tank only. Is it necessary to have a pre filter along with this water purifier? It is not necessary to have a pre filter. But it is a good idea to have a pre filter as it adds more layer of protection. Usually pre filters are cheaper online. You can check price here. Does it have TDS controller? Yes, it comes with a TDS controller. Whats the difference between Aquaguard Geneus and Aquaguard Geneus plus? The main difference between Aquaguard Geneus and Aquaguard Geneus plus is Aquaguard Geneus Plus has Biotron Cartridge whereas Aquaguard Geneus does not have it.